He has sold his business premises and is downsizing, Michael Allen tipped us off three weeks ago and we only managed to visit at closing hours today. I’ve known him for thirty years or so but as I collected mainly contemporary works I never used his services. Every major art institution in Australia has though, his reputation is known the world over. 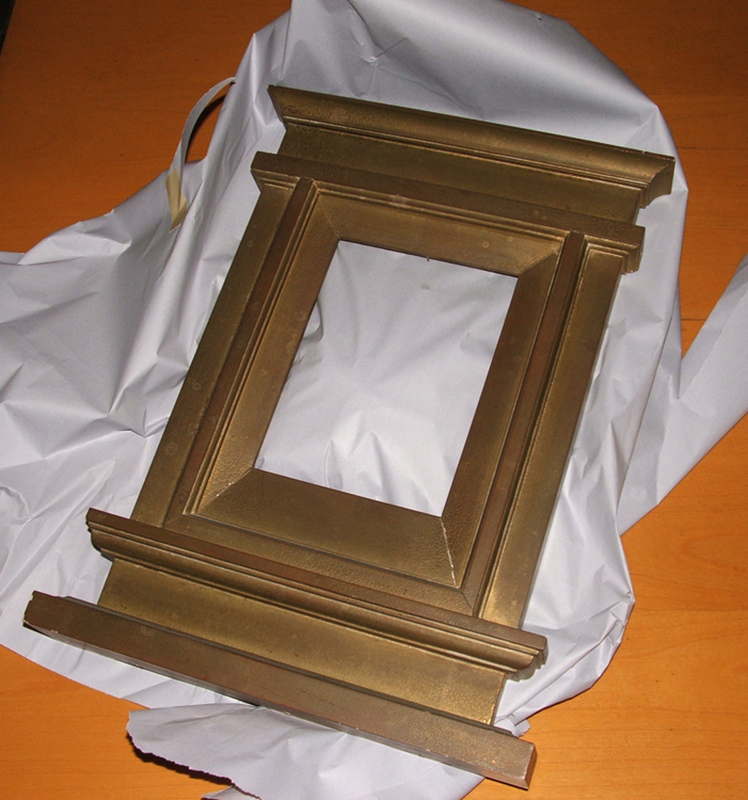 Its nothing for say the Rijksmuseum to pay $200,000.00 for a hand built frame for their latest 17th-century Dutch Paining by Johannes Vermeer. . . . painstakingly crafted by Graham and his team, in Australia. Well everything is being sold . . . Barbara and I bought two frames today. 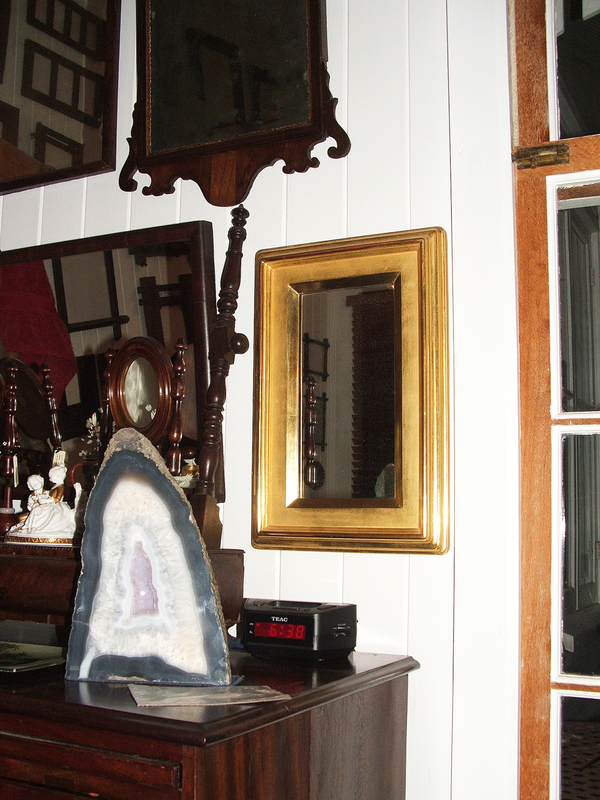 Already installed our the bedroom, this 23ct water gilded and burnished mirror was $2,000.00 and we bought it for $200.00 The bronze patinated tabanacle frame is now Barbara’s piece and cost us $280.00 . . .
My wife Barbara Heath did titanium frame designs for Johno early on and we had numerous trips to Sydney, met Jean-Pierre, Susan and his partner Mark. As I always do I couldn’t help but ask pertinent questions about the marketing and the shape of his organisation . . . it ended up in my partnering with Johno to completely change-force his brand and in the end we managed to buy back his own name from N.Z. businessmen. 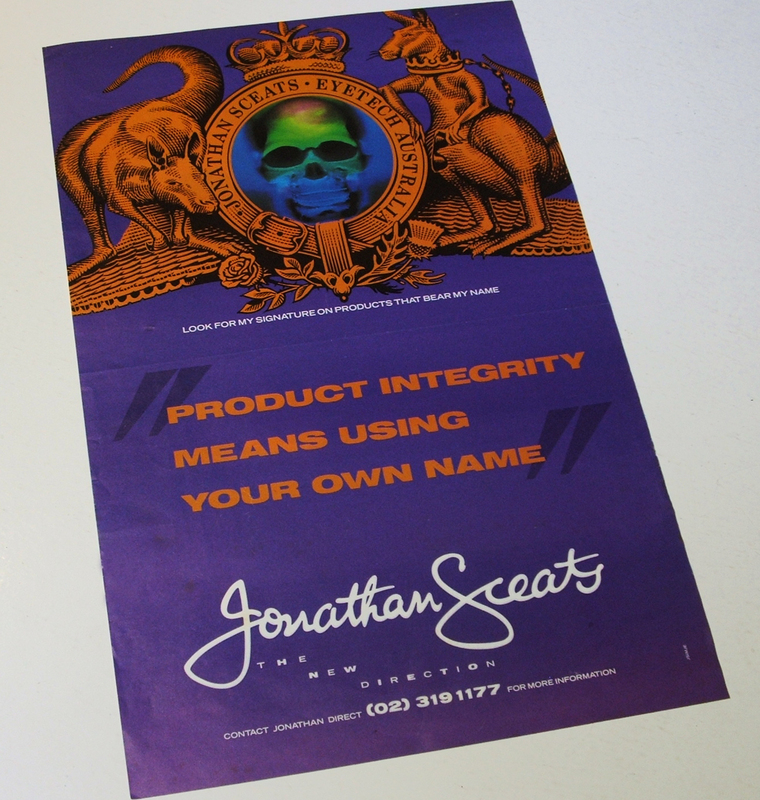 His own signature became synonymous with his own products, the Jonathan Sceats brand was given the edge that he himself so naturally displayed. We went back into his own family history and seriously re-jigged it reflecting his own ‘Aussie-ness’ and his 3D love of the ‘skull’ element. Our marketing strategy was our product promise . . . gutsy stuff for 1987. I posted this to my FB page on Friday night when there is not that much traffic, so here it is to all of our viewersite clients & friends, enjoy the history ride . 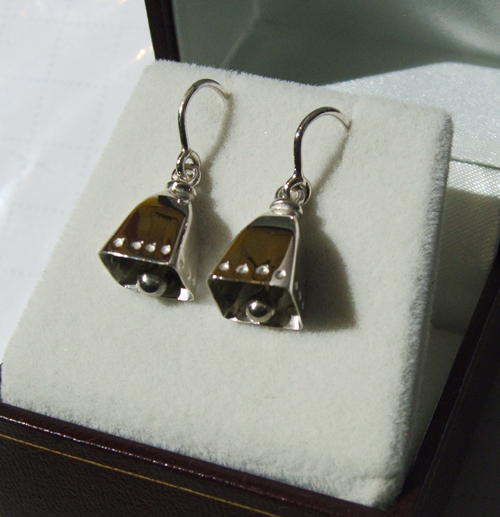 . .
I’ve had these small gold bells in the collection for ages and they came out in conversation and then Janet asked the studio to hand-make a pair for her. 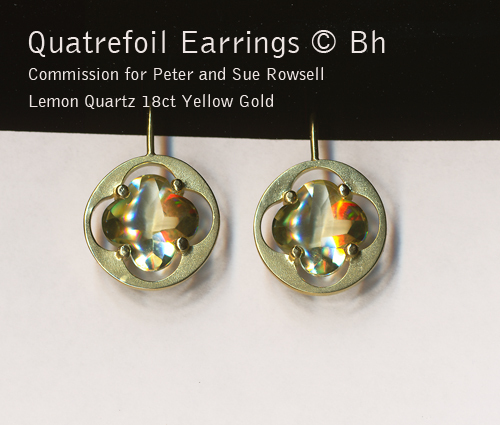 I’ve posted the originals on my design blog here. Do go and view and let me know if you have any idea what the letters say? or suggestions as to their origin. 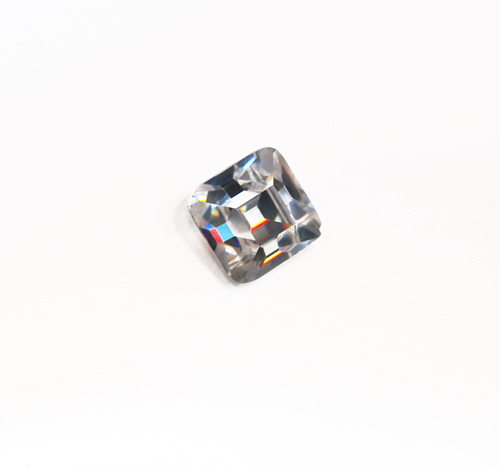 We have sourced and had cut this Table Cut gem Cubic Zirconia in the same way as a 17th Century diamond cutter would have done it, leaving the round edges unpolished. Cleaving a macle to allow a view into the gem, then simply polishing the existing sides of an octagonal crystal. Georgian silver finely engraved button – Scottish with a running fox. Found in London and into the studio collection although Barbara’s dog collection that I’ve been building for twenty years or so now needs a resort as she keeps taking pieces into her secret realm . . . dogs (foxes) especially! 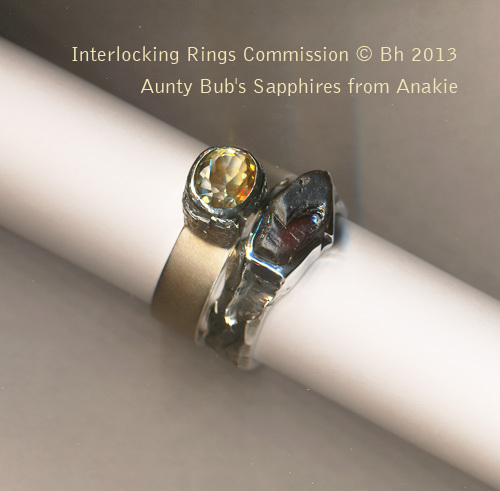 One of Barbara’s earliest sets of stacked interlocking rings was purchased at a Cintra House exhibition by Glenn Cooke, who was the decorative arts curator at the Queensland Art Gallery. ‘Cook-e’ has been a friend and supporter of us both and also we share many interests, Australiana: furniture and gold & silversmithing, chip art, tea towel art, matchstick art and found ephemera plus we are all members of the Australian Garden History Society. His third commission is featured today. Glenn Cooke was offered the three pieces by Sharon at Lancasters in Toowoomba ages ago, he scooped the two chairs as they had wood and more particularly tooled leather work. 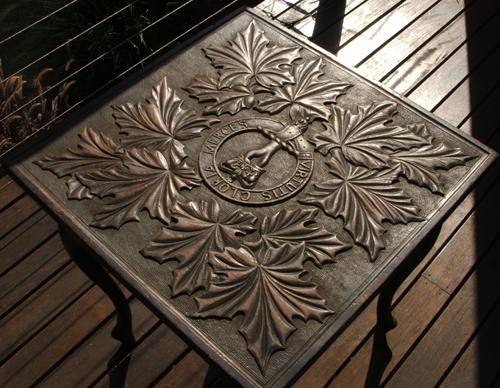 He declined the deeply carved table from the set which shows her family crest by marriage, that of the Robinson clan. We are so fortunate to own this piece of early Queensland cabinetry using local timbers by an important female maker. Anna Craig / Miss Lubke was trained as a leather worker, was born Anna Charlotte Lubke in Hanover, Prussia, grand-daughter of the Count von Hartung. George Hulber of Hamburg had revived the ancient art of leatherwork and was accorded considerable fame in Europe at the time; Miss Lubke was one of his few students. She practised her leatherwork in Hamburg, then moved to London where she won awards, including a diploma for a leather-bound book at the 1896 East London Trades, Industries and Arts Exhibition. She was employed as private secretary to Princess Beatrice of Battenberg. Anna came to Australia in 1898 as companion to the wife of the owner of the Valley of Lagoons, a station on the Upper Burdekin, North Queensland. There she met, and the following year married at Ingham, Charles Baker Craig. She spent her early married years at the Valley of Lagoons. Housework was performed by Aboriginal servants so she had time to devote to her craft. Later Mr Craig acquired a property, Craigmore, in the Toowoomba district and the family moved between the two. Mrs Craig exhibited her leather and marquetry work with the Toowoomba branch of the Royal Agricultural Society of Queensland from 1902 to 1920; in 1914 her embossed panels included Phoebus and Apollo , Diana and Mermaid . In 1920 she received silver medals for her embossed leatherwork exhibits. She also showed leatherwork at the 1907 exhibition of the Austral Association. A leather screen and an album cover were exhibited in the preliminary Brisbane Women’s Work Exhibition that year; when shown in Melbourne the screen was awarded a first and a special prize in its class. She received a Queensland Jubilee Medal for her piano stool in leather work at the 1909 Queensland National Agricultural and Industrial Association (QNAIA) Exhibition at Brisbane and prizes for embossed leather work at the Rockhampton Agricultural Society Shows in 1917, 1918, 1933-36. 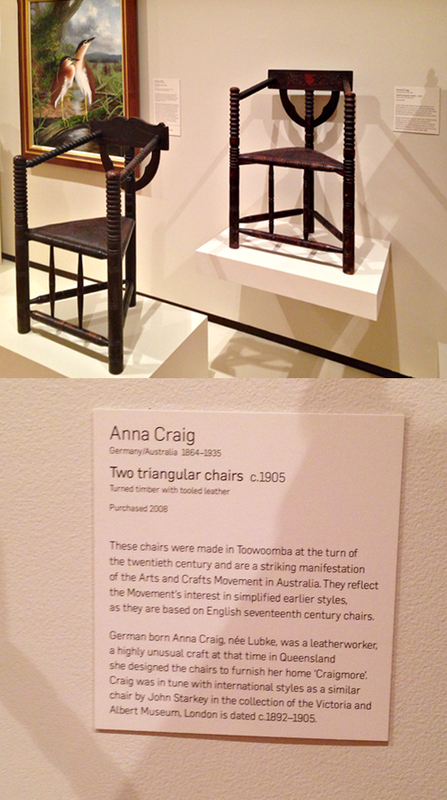 In 1922 the Craigs moved to Waverley Road, Taringa, Brisbane, and Anna began to exhibit regularly with the QNAIA. Between 1925 and 1936 she was awarded several prizes for her leatherwork and marquetry staining. From Glenn Cooke’s biography of her in 1995.